This book is a succinct and distinctive presentation of current research addressing educational issues in relation to children and young people with disabilities in Southern contexts. 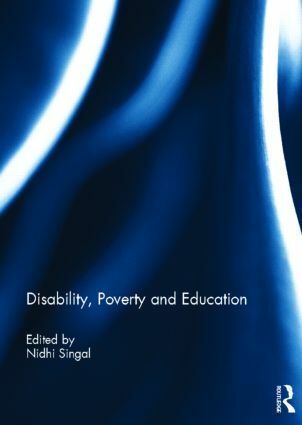 Even though people with disabilities are disproportionately over-represented in the majority world, there is a lack of texts which bring together empirical insights highlighting the unique socio-economic and cultural realities of these contexts and the ways in which these have shaped developments in education. This book provides a comprehensive and critical overview of a range of issues, such as the dilemmas in conceptual translations, analysis of international aid and national policies, evaluation of various educational interventions, and issues interrogating the purpose of education. Bringing together various research projects conducted in eight different countries, this book successfully captures a unique spread of cross-cultural issues. It was originally published as a special issue of the International Journal of Inclusive Education. Nidhi Singal is a Senior Lecturer at the Faculty of Education, University of Cambridge, UK, and Fellow at Hughes Hall College. She was the international team leader for the Disability, Education and Poverty Project (part of the Research Consortium of Educational Outcomes and Poverty, 2005-2010) funded by DfID, UK.